Are you an Android user and Xbox Live user? If so, then you’ll like this latest news announcement: Android users can now earn Xbox Live achievements by playing games on Android. This feature isn’t available for all Android games. In fact, it’s only available for one game so far. That game is Wordament, which is arguably the best Windows-exclusive game available today. Wordament is a simple word puzzle game that tasks players with making as many words as possible out of a grid of letters. Players compete against one another with themed words, speed rounds, and other features. 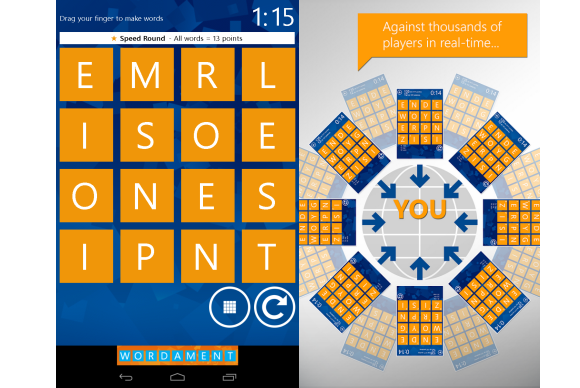 Players receive rewards for making the longest words, beating other players, and beating their own top scores. Progress is tracked over time, making it easy for players to reflect on their greatest in-game memories. Like many Xbox Live Arcade games, there’s a persistent Xbox Leaderboard where you can see the best players of all time as well as the best players of the last day or hour. To earn Xbox Live achievements on Android, you’ll need to install Wordament and sign in using your Xbox Live ID. This is the first time Android users have been able to earn Xbox Live achievements while playing on the Android platform. Even better, the game will synch your Xbox Live user settings across all devices, which means you can play Wordament with friends using Windows Phone, Windows 8, iOS, or Android. Apparently, Wordament for Android has some lag problems on a few different Android devices. If you believe Google Play Store reviewers, then the Nexus 7 is particularly bad at running Wordament. Other devices don’t seem to have problems. If you want to check out Wordament for Android today, then click here to visit the Google Play Store.